These heater controllers consist of power semi-conductors (SCRs), properly-sized heat sinks, trigger circuitry, and fuses supplied on panels for surface mounting. 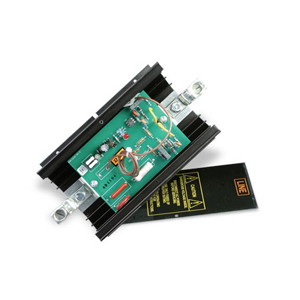 The SCR power controller accepts a 4 to 20 mA dc output from a temperature controller or can be supplied with manual option using a remote potentiometer. The SCR19 Series controllers offers two methods of proportional control – Zero-voltage-switched and Phase-angled-fired. With the Zero-voltage-switching mode, the controller switches on complete cycles of the ac supply voltage. The trigger circuit is designed to turn on the SCRs as close as possible to the point where the AC sine wave crosses through zero. In effect, the line voltage is turned on and off and applied to the heaters in whole cycles. With an input of 4 to 20 mA, the output of the heter controller will be off below 4 mA and full on at 20 mA. Proportioning action is obtained by varying the number of cycles on to the number of cycles off. The output will vary from one cycle on and nine cycles off at low input, to all cycles on at maximum input. The output of the SCR19 SCR power controllers is integrated by the heaters which produce a smoothly proportioning heat output that varies directly with the input signal. With the Phase-angle-fired mode, the power to the load is controlled by governing the point of turn on (firing) of each half cycle of the full AC sine wave.